Miscanthus x giganteus also known as Elephant grass or "e-grass" is the crop of choice for the Biomass Investment Group, an American biofuels company based in Florida. The firm is launching its first major plantation investment in Sarangani Province, in the Philippines. According to the Sun Star, it plans to rent 11,000 hectares and offers as much as US$400 per hectare per year for farmers who would be leasing their lands to the project. To Philippine standards, this is a very good deal. The Biomass Investment Group said it would pay the farmers five years in advance for leased lands. But what's so special about Miscanthus? First of all, it is a tropical grass native to Africa and Asia which uses the C4-path to fixate carbon during photosynthesis, which means it produces biomass very efficiently. It grows like bamboo, that is in a rhizomatic way, spreading its roots and producing a number of new shoots along the way. Its productivity is typical for giant tropical grasses, with a dry weight annual yield that can reach 25t/ha (10t/acre). E-grass requires about 600-800mm (25 inches) of water every year to survive, could thrive in brackish water, uses a minimal amount of nutrients from the soil and has few competitors. Mature stalks grow to an average height of 4 metres (25 ft) and an average diameter of 3cm (1inch). The grass, which is also a good material for making paper, is considered a high-yield perennial herbaceous crop that could be harvested twice a year. -biomass gasification: a thermo-chemical process in which the solid biomass is converted in a vapor known as synthetic gas. This syngas can then be liquefied to produce a green synfuel, or it can be used directly in existing gas-power applications. -densification and combustion: grass-pellets can be co-fired with coal. Due to its low mineral and subsequent ash content, Miscanthus makes for a very good co-firing feedstock. 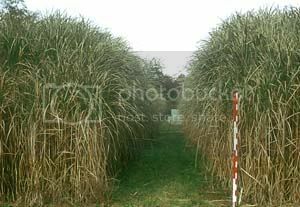 In short, Miscanthus x giganteus is a tropical grass that, due to its high yields and low agricultural demands, promises to be a biofuel crop of the future. Since it is a tropical grass native to Africa, and since it can be planted in the vast savvanah's of the continent, it is a crop the BioPact will certainly focus on more.